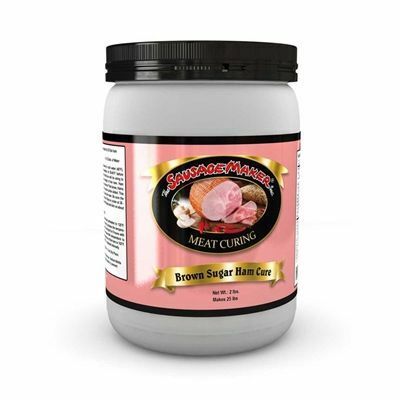 You�re viewing our Sausage Maker country brown sugar cure � 2 lbs. For hams or bacon. Directions on package. 2 Lbs. will cure 25 lbs. of meat. The Sausage Maker cure for pork is easy to use, infusing ham and bacon with the delicious, sweet flavor of brown sugar. Includes full instructions for using a brine, ham/bacon should be stich-pumped use a meat pump with perforated needle for pumping meat. Read the step-by-step instructions for dry rub cure for bacon instead of wet brining/pumping method. Follow the directions on the package to cure meat, 2 lbs. of our product will cure 25 lbs. of meat. Contains 2 lbs. cure per package. We have answers to any questions you may have about our products. 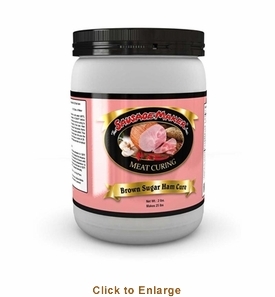 Scroll down to view our Sausage Maker country brown sugar cure � 2 lbs.